Ready, set, play! 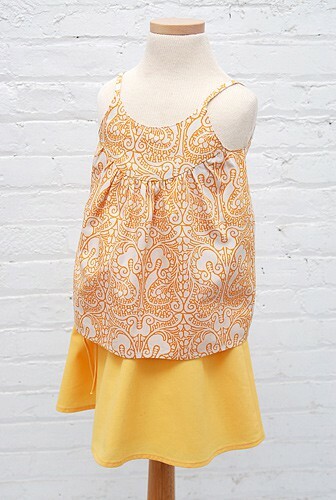 Children's top is tunic-length with thin spaghetti straps, buttoned placket in back, and gathered ruffle. Full, gathered skirt sewing pattern features elastic and drawstring casings and a built-in lining for added fullness. 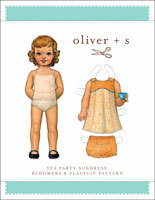 Share your photos on Instagram with the hashtags #swingsetskirt and #oliverands. 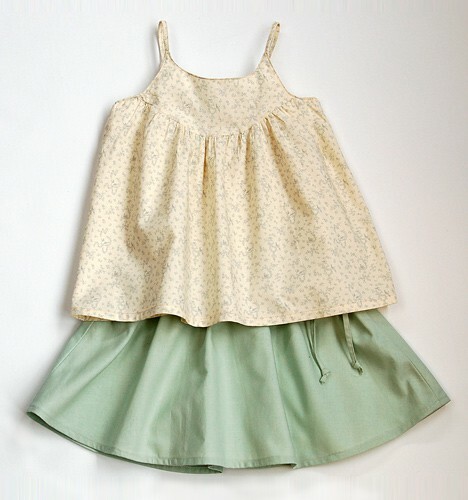 Girl's tunic and skirt. 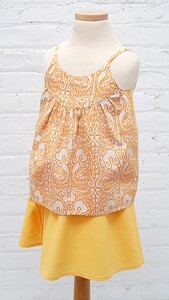 Top is tunic-length with spaghetti straps, buttoned placket at back, and gathered ruffle at bodice yoke seam. Full, gathered skirt has two elastic casing with a centered drawstring that ties at the side. After successfully sewing this pattern, you will have developed the following skills: buttonholes, curved seams, gathering, and lining. Light- to medium-weight woven fabrics like cotton broadcloth, batiste or calico, and lightweight linen, denim, chambray, or seersucker. Top: Three 3/8" or 1/2" buttons. Skirt: 1 package of 1/4" elastic and optional 1 1/4 yards of 1/4" ribbon for drawstring. Tunic Length 10 ¾" 11 ½" 12 ¼" 13" 13 ¾"
Skirt Length 7 ½" 8" 8 ½" 9" 9 ½"
Tunic Length 14 ¾" 16" 17 ¼" 18 ½"
Skirt Length 10 ¼" 11" 11 ¾" 12 ½"
I made the Swingset Tunic for my niece for her birthday along with the Picnic shorts. It was adorable. An easy to follow pattern with great shaping for a little one. The straps were way too long for her, though. I was making it as a gift, so I didn't have her in front of me to try it on as I was sewing the top. Definitely check the strap length when you're sewing this to fit the kid. I had put off making this pattern as it is only in digital form and I am not into taping pattern pieces together. I was able to purchase a new paper copy on ETSY and I am so glad I did. The skirt is adorable and an easy sew. I was a little more challenged with the top. I followed Nicole's tutorial and it explained some of the mysteries. It was a fun sew. I intend to make the skirt .i've washed the fabric for the skirt and lining.A cotton and steel cotton and pale pink lawn for the lining. 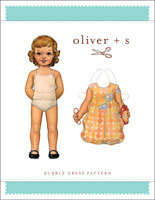 I love O and S patterns and find the instructions excellent. One of the earlier patterns in the smaller size range but not to be overlooked. A highly enjoyable sew, the construction of the bodice leaves you feeling like a rock star. The skirt has a lovely fullness that sits perfectly over a babies nappy. Its also very easy to enlarge, simply extend the length of the skirt and adjust the waist accordingly. 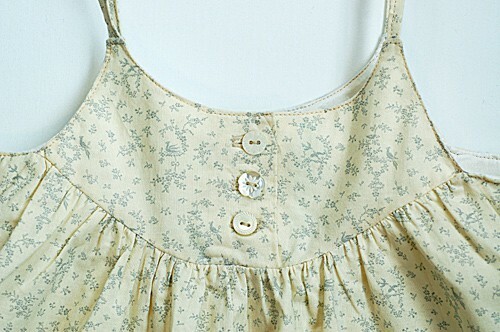 I have a step by step tute here if you are feeling nervous http://fiveandcounting-motherof5.blogspot.com.au/2011/02/swing-set-for-birthday-girl.html My very favourite look is to match the skirt with the bodice frill http://www.flickr.com/photos/motherof5/5291906588/in/photostream/ Perfect for a hot Antipodean Christmas. Please note that the following errors apply only to the first printed version of this pattern. All these issues have been corrected in the digital version of this pattern. In the first printed version of the pattern, the chestsizing in the Finished Measurements chart contained an error. Please refer to the chart under the "details" tab for the correct measurements. Pattern piece numbers 2 and 4 should have a dot located 1/2" from the bottom edge and 1/2" from the back edge of the pattern. Finally, please note that in the first printing of the small sizes (0-3m, 3-6m, 6-12m, 12-18m, and 18-24m), piece #4 was mislabeled as 6-12 months for the size 12-18 month and 18-24 month pattern pieces. Because the pattern pieces for each size are printed in rows, you should easily be able to determine the correct pattern piece for each size. 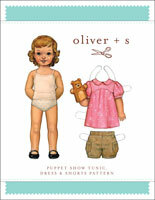 Discussion on the digital swingset tunic + skirt sewing pattern from the Oliver + S Discussion Forums. Find and share more photos on Instagram using the hashtags #swingsetskirt and #oliverands.